On August 23rd, our last full day in Fukushima, my husband, his cousin and her youngest son and I, went to Iwaki city. A place that has earned much fame during the past 5 months, but not because of scenic views, famous buildings, amazing local dishes or other such tourist things. In fact Iwaki is not famous for such positive things of any kind, there is a lot darker reason behind the now known city name. Iwaki was one of the cities, which ended up a victim for the great tsunami that followed the biggest Japanese earthquake back in March. I am not sure why I wanted to visit Iwaki. A place, which has witnessed more horror, more sorrow, more grief and more tears than any place deserves. For some reason I was drawn to the place. Not because I wanted to say, “I was there”, but because I wanted to see it with my own eyes. Back when the earthquake and tsunami hit, while watching the news I felt so much pain. Not just for the people who lost their lives, but also for the people who was left behind, those who had lost loved ones and those who had lost everything they owned. So, there we were, on our way from Koriyama city to Iwaki city an around 2-hour drive. On the way, the regular highway signs announced the upcoming cities and the connected exists, I couldn’t help but looking even closer at the sign announcing Soma city – the city of the nuclear plant. I looked to the side and I could spot blocked roads, telling people not to enter what has now become a ghost town. We reached Iwaki city and first we went to the nearest harbour. Already there the sign was evident. Trees and fences were bended, houses and buildings were missing and others were in ruin. It felt unreal. We drove along the seaside and saw more devastation. Iwaki had cleaned up all the garbage the tsunami left, like, wood, personal items, cars and even ships. That garbage was still located on big lots, located in various places. Seeing that such things, just a few months back, was lingering in the streets of the city also had an impact. There were a lot of places that were recognizable from the news. Also the cousin stopped a lot of places and said in a quiet voice, “I saw this place in the newspaper”. Also she seemed to be affected by everything. She also stopped by a 7-eleven, or what was left of one and mentioned the news again. Outside the store was a figure what had “let’s do our best, Iwaki” written on it. I had seen so many “Let’s do our best, Japan/Tohoku/Fukushima” signs, but that one was memorable. I think everyone in the car was affected by what we saw. Even the cousin’s young son kept saying “ひどいね” (It’s terrible.) It truly was. That evening, the cousin showed me Iwaki on a map, telling me that it was only located 25 km from the nuclear plant (20 km being the safe zone), which I didn’t know. I started asking more about their personal experiences and I listened intensely. How they experienced the shaking, the sound of dozens of helicopters flying towards the nuclear plant above their house, how they tried to seal the house from outside air, the empty supermarkets and the long queues of people hoping to get a little gas for their car. There was so much I wanted to know and the family had so much to tell. August 22nd was our first full day in Fukushima. That day my husband’s relatives had planned a trip to famous places in Fukushima prefecture, including Aizu city and Tsurugajo castle. Already around 9 o’clock in the morning we got into the car. My husband, his cousin, his aunt, his eldest uncle and the cousin’s son and I filled out the seven-person car pretty well. I was actually still trying to figure out who exactly was living in the house we stayed in, but I did like the feeling of finally being apart of a “bigger” family. Due to getting to bed too late and getting up too early I quickly felt asleep during the drive. Our first stop was some kind of cave area; I unfortunately didn’t catch the name of. You crossed a wide lake on a bridge, which liked to sway beneath your feet. After walking up some very steep stairs there was a small shrine, after that we returned to the car. After some more driving, we reached Ouchijuku. A small, isolated village surrounded by the many mountains of Fukushima. This village has been kept in the original style and shape, with some similarities to the famous Shirakawa-go in Gifu prefecture. Of course this was just a small version, with one main street, but it was still interesting and there was a lot of old styled shops selling candy, souvenirs, ingredients and etc. There were also a lot of soba restaurants and ice cream shops. My husband’s aunt bought us soft ice cream with sesame flavour, which were surprisingly good. Then we got into the car, yet again and went to the main attraction of the day, Tsurugajo Castle in Aizu city. The castle had recently been through renovation, where the roof tiles also got reverted from grey back to the original red colour, which is a unique colour among the castles of Japan. For me, who has already seen a great amount of Japanese castles, the red tile colour also seemed to be what stood out the most about this particular castle. Tsurugajo castle that has a very good size, white walls, a nice garden and nature area and then the pretty red tiles, was surely worth the visit. Especially since I love seeing Japanese castles, since they’re all unique and special in their own way – even though most of them are copies of castles, which burned down centuries ago. After that we looked for a place to eat and for some reason the uncle had decided that it had to be a ramen restaurant. We ended up in a restaurant/museum, which was a truly interesting experience. Not so much that we were the only people in the building. More that it was an original, big house from very old times. When we entered we took our shoes of by the door and we were then led into a big room with tatami floors. There was a lot of small tables and pillows to sit on, we all sic sat down and ordered our food. After eating this late lunch, it was time to head home and once again I fell asleep in the car, but this time around, the aunt, the cousin’s son and my husband joined me. My husband and I went to our room to relax and he also continued his nap, until around 8 o’clock where we were offered a late dinner. A very delicious dinner and then all of us watched television and talked until it was time for bed. Sunday August 21st was a rather busy day for my husband and I. First we had promised to meet a group of his friends around 11 am at a restaurant, that one of the friends owned which meant we had it to ourselves. His friend served us all kinds of amazing fish dishes that made me eat even when I was past full. I enjoyed the company of his friends, who also had a lot of interesting questions to ask me. Questions which was heard to hear at times due to a lot of energetic children running around. We could not stay longer than a few hours though, since we later had an appointment with a Shinkansen departure (Bullet Train). Actually my husband was stalling things a bit, that resulted in us rushing bit to get to Tokyo station in time. Our destination was the recently famous Fukushima prefecture. The prefecture, which is home for the unstable nuclear reactor that has been close to, a meltdown since The Great Earthquake back in March. Our reason for going to Fukushima prefecture is to visit some of my husband’s relatives who live in Koriyama – around 50 kilometres from the nuclear reactor. The Japanese safety zone is 20 kilometres, but Europe seem to think the safety zone should be bigger, some even think around 80 kilometres is preferred. So saying the nuclear reactor was not on my mind a bit, would be a lie. 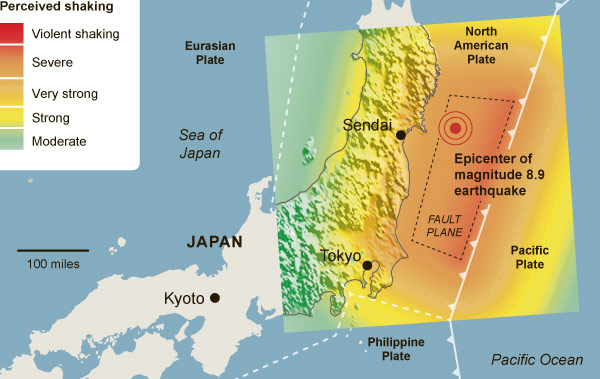 My husband seemed to fear the big earthquake that still frequently hits Fukushima, even reaching 5 on the Richter scale. So around one and half hour later we arrived at Koriyama station and met my Husband’s cousin who was there to pick us up. We drove around 10-15 minutes and then arrived to a house. Inside there were four people to greet us; the cousin’s son, her parents (my husband’s uncle and aunt) and another uncle. We sat down around a table in the living room and I quickly started admiring the house, which was bigger than I imagined. (I was used to the size of some houses in the Japanese country side, but this one just seemed far more fancy) It seemed newly renovated, but still had a lot of traditional Japanese feel to it. As it got later more family members started to arrive (the cousin’s brother and sister and their families) and also the cousin’s two other sons returned. I lost track of the amount of people who suddenly surrounded me and even though my stomach was filled from lunch, I did my best to eat some of all the food with was put in front us (huge amount of sushi, fried things, vegetables, etc.). There was a lot of talk about “The Great Earthquake“, especially questions about where my husband was when it stroke and their own location. The family had a lot of personal experiences about that terrible day back in March to tell about and hearing it from a first-hand-sources was a great experience. Something very different. It became very late before we got to take a shower and was showed our room upstairs. Before we went to sleep we were told that tomorrow’s departure was 9 o’clock, where the destination was the Aizu area and the Aizu castle. Bonnie Pink: The Sun Will Rise Again. Famous Japanese singer Bonnie Pink revealed her newest song “The Sun Will Rise Again” dedicated to the Tohoku earthquake victims. According to her official page she recorded this song in her own home to add to the collective effort to conserve electricity. A video that explains the current nuclear crisis to the children of Japan. This is probably the best way to explain the situation going on in Fukushima to children and at the same time keep them calm in these worrying times. “Pray for Japan” in Japanese. Just a quick post. I was checking my visit stats and especially the keywords used for finding this blog. Of course “pray for Japan” was highest on the list. 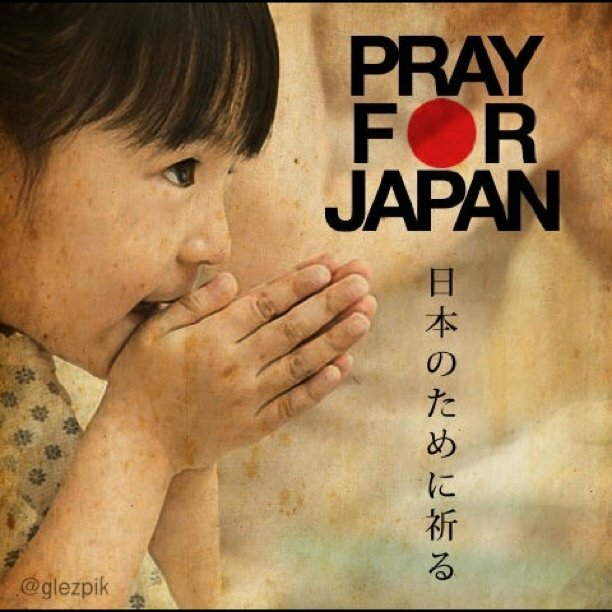 An interesting keyword was “pray for Japan in kanji” which also gave me a lot of traffic, though I have not written it on this blog, which is why I thought I would write it. The news keeps showing us new pictures and videos of the destruction and the death toll keeps rising. Now it’s likely over 10,000, not to mention all the people who has lost their homes, who only have limited supplies on food, water and shelter. People seeing the destructions with their own eyes, trying to recognize a city, an area or a street they’ve once walked so many times. And then there is the people who are now mourning over their lost ones. The biggest pain of all and something that can’t be replaced. I’m not Japanese, but still I feel Japan is also a part of my life, a part of me. One way or the other, Japan affects my life everyday. Whether it’s talking to my Japanese fiance, or my family-in-law, studying Japanese language, history and culture at my university or spending time in Japan in general. Japan is always there, in my mind, in my heart and has been there for years. As we all should know by now, Japan was yesterday (March 11th) hit by a 8.9 earthquake. The seventh most powerful in history, followed by a huge tsunami which swept whole cities clean on it’s way. The destruction of this earthquake is nothing but terrifying and once again makes us human beings seems so small when we’re faced with the real powers of mother nature. 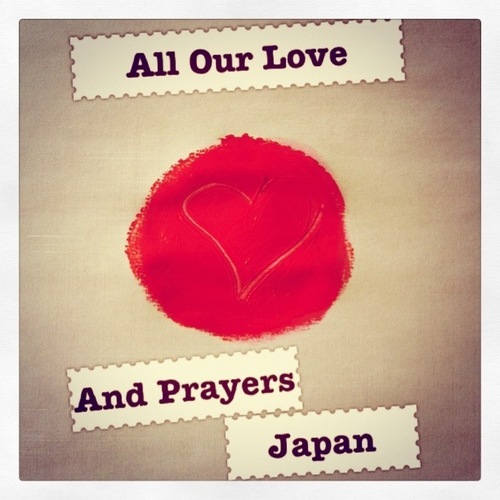 All my prayers go out to the people affected by the earthquake and the people of Japan in general. Since Japan now have to face a very hard time when it comes to restoring what have once been. We must of course not forget about of the hundreds of lives lost, which never will be restored and those who now suffer from having lost a person they knew. Yesterday I received several calls and messages from friends and family who wanted to express their concerns regarding my fiance and my family-in-law. Since so many people thought of me when they saw the news, it really reminded me of the fact that, Japan has become a huge part of my life, even when I’m here in Denmark. It’s a scary feeling. I can’t express enough how these news has affected me, even though I’m not in Japan right now. It’s hard for me to watch the pictures and the videos, knowing that this happened in a country I’ve been to so many times. A country that has special place in my life and in my heart. A country that seems like a big part of my future and of course this is the country of my fiance and my family-in-law. “Honk For Japan” in Japanese. Famous youtuber Nigahiga’s “Honk For Japan” video actually made it to Japan. A talk show host in Japan appears to have discovered Nigahiga’s video and decided to show it on her own show, in hopes of inspiring the people of Japan. I’m happy to see Nigahiga’s (Ryan’s) warm video and generous gesture made it to Japan. Since I’m already a subscriber to his channel I saw the video on the day he uploaded it and was very touched by his commitment to try and help Japan and how he also urges other people to do the same. And I think it’s a great thing that people in Japan now also get a chance to see this video. With this video he was able to show that not only he, but a lot of people care about what happened in Japan and with every 1,000,000 view his video gets, he promise to donate another 600 USD to the Red Cross foundation. So get the views rolling people!